Domino Records continue their long standing tradition of putting out the best in down and dirty Rock n’ Roll with their latest big release, Amphetamine Ballads, the debut album by Glasgow trio The Amazing Snakeheads. 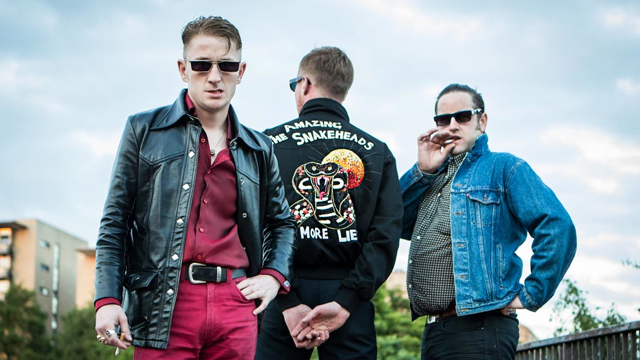 Described by The Guardian as “raw and potent and alive,” The Amazing Snakeheads channel the sounds of such scuzzed-out giants as The Birthday Party, The Cramps, and Roky Erickson. Amphetamine Ballads is the soundtrack to the dark corners of nightclubs and those dimly lit alleyways off the main drag. The smell of smoke and liquor pervades everything. Recorded at night time at The Green Door Studio in Glasgow, this is a subterranean record – an album that can show you round the parts of a city that come alive after dark. Amphetamine Ballads is available now on CD, LP, and as a Digital Download.